"Olathe" redirects here. For other places called Olathe, see Olathe (disambiguation). Olathe (/oʊˈleɪθə/ oh-LAY-thə) is the county seat of Johnson County, Kansas, United States. It is the fourth most populous city in the Kansas City Metropolitan Area and Kansas. With a 2010 population of 125,872. By 2017, the Census Bureau estimated Olathe's population had grown to 137,472. It is the headquarters of Garmin. Olathe was founded by Dr. John T. Barton in the spring of 1857. He rode to the center of Johnson County, Kansas and staked two quarter sections of land as the town site. He later described his ride to friends: "...the prairie was covered with verbena and other wild flowers. I kept thinking the land was beautiful and that I should name the town Beautiful." Purportedly, Barton asked a Shawnee interpreter how to say "Beautiful" in his native language. The interpreter responded, "Olathe." Olathe was incorporated in 1857, and while not the first city in Johnson County, its rapid growth lead to it being named the county seat in October 1859. Rising tensions across the nation over the issue of slavery lead to numerous clashes between abolitionists settlers and neighboring slave state Missouri. These clashes would further escalate and become a part of the greater conflict known as Bleeding Kansas. With the admission of Kansas into the Union as a free state in 1861, violence began to dissipate. Peace, however, would continue to elude Olathe for many years to come. In 1861 Union officials and local military forces created a military post in the city. It housed one company of troops along with the local militia. On September 6, 1862, William Quantrill led a surprise raid of guerrillas Confederates against the city, which resulted in a half dozen deaths and the destruction of most of the city. Quantrill captured the outpost and tried forcing the men to swear an oath to the Confederacy. The oath was deemed invalid in November 1862 since the guerrillas were not considered legitimate enemy military units. Kansas militia continued to occupy the Olathe military post through the rest of the Civil War. Confederate forces would attempt two further raids against the city. The first happened on August 20–21, 1863 as Quantrill was passing through on his way to Lawrence, Kansas (see Lawrence Massacre). The second raid occurred October 24-5, 1864, when Confederate Major General Sterling Price, with a force of 10,000 men passed through on their retreat South (see Price's Raid). With the Confederate surrender, the military post was decommissioned in August 1865. Olathe served as a stop on the Oregon Trail, the California Trail, and the Santa Fe Trail. Catering to travelers was the main source of income for local stores and businesses. The Mahaffie House, a popular resupply point for wagons headed westward, is today a registered historical site maintained by the City of Olathe. The staff wears period costumes, and stagecoach rides and farm animals make the site a favorite among children. Visitors can participate in Civil War re-enactments, Wild West Days, and other activities. In the 1950s, the construction of the Interstate Highway system and, more directly, I-35, linked Olathe to nearby Kansas City. The result was tremendous residential growth as Olathe became a part of the Kansas City metropolitan area. In the 1980s, Olathe experienced tremendous commercial growth, which also drew more residents. It is estimated that Olathe's population surpassed 100,000 in 2001, and current projections show Olathe's growth continuing as the city expands into the farm fields south, west and north of town. In 2008, the U.S. Census Bureau ranked Olathe the 24th fastest-growing city in the nation. The same year, CNN/Money and Money magazine ranked Olathe #11 on its list of the "100 Best Cities to Live in the United States." On February 22, 2017, Adam Purinton made racial statements and opened fire at crowded Austins Bar and Grill in southern Olathe, shooting and injuring three people, one fatally. The victims were identified as Alok Madasani, Srinivas Kuchibhotla, and Ian Grillot. Purinton was later arrested in Clinton, Missouri. He was charged with one count of first-degree murder and two counts of attempted first-degree murder. This shooting gained international attention, as two of the three victims were Indian. Despite efforts by preservationists, Olathe city officials committed to upscale apartment development and county government expansion projects have fast-tracked demolition of 19th century historic homes and neighborhoods, including the Hubbard House, a Greek Revival landmark built in 1887 by an early Olathe surveyor, which was reduced to rubble in less than an hour in January, 2018 despite a petition signed by more than 6,000 local residents. Artifacts from the home, including a grandfather clock and clawfoot tub, were retained for display in a future apartment clubhouse. Olathe is bordered by the cities of Lenexa to the north, Overland Park to the east, De Soto to the northwest, and Gardner to the southwest. According to the United States Census Bureau, the city has a total area of 60.42 square miles (156.49 km2) of which 59.66 square miles (154.52 km2) is land and 0.76 square miles (1.97 km2) is water. Olathe has two public lakes: Lake Olathe with 172 acres (0.70 km2) of water surface and Cedar Lake with 45 acres (0.18 km2). Olathe has a humid continental climate, with cold winters and hot summers. Temperatures range from an average high of 39 °F (4 °C) and low 20 °F (−7 °C) in January to an average high of nearly 90 °F (32 °C) in July. The temperature reaches 90 °F (32 °C) an average of 36 days per year and 100 °F (38 °C) an average of 3 days per year. The minimum temperature falls below freezing (32 °F) an average of 102 days per year, but rarely drops below 10 °F (−12 °C). Typically the first frost occurs between mid-October and the first week of November, and the last frost occurs between the end of March and the second week of April. The area receives about 40 inches (1,000 mm) of precipitation during an average year with the largest share being received in May and June—the April–June period averages 30 days of measurable precipitation. During a typical year the total amount of precipitation may be anywhere from 28 to almost 53 inches. There are on average 95 days of measurable precipitation per year. Winter snowfall averages about 19 inches, but the median is 13 inches (330 mm). Measurable snowfall occurs an average of nine days per year with at least an inch of snow being received on seven of those days. Snow depth of at least an inch occurs an average of 25 days per year. Notes: Temperatures are in degrees Fahrenheit. Precipitation includes rain and melted snow or sleet in inches; median values are provided for precipitation and snowfall because mean averages may be misleading. Mean and median values are for the 30-year period 1971–2000; temperature extremes are for the station's period of record (1939–2001). The station is located three miles (5 km) east of Olathe at 38°53′N 94°46′W, elevation 1,055 feet (322 m). As of the census of 2010, there were 125,872 people, 44,507 households, and 33,274 families residing in the city. The population density was 2,109.8 inhabitants per square mile (814.6/km2). There were 46,851 housing units at an average density of 785.3 per square mile (303.2/km2). The racial makeup of the city was 83.1% White, 5.3% African American, 0.4% Native American, 4.1% Asian, 0.1% Pacific Islander, 4.1% from other races, and 3.0% from two or more races. Hispanic or Latino of any race were 10.2% of the population. As of the census of 2000, there were 92,962 people, 32,314 households, and 24,623 families residing in the city. The population density was 1,716.4 people per square mile (662.7/km²). There were 33,343 housing units at an average density of 615.6 per square mile (237.7/km²). The racial makeup of the city was 88.63% White, 3.70% African American, 0.43% Native American, 2.74% Asian, 0.05% Pacific Islander, 2.64% from other races, and 1.80% from two or more races. Hispanic or Latino of any race were 5.44% of the population. 26.1% were of German, 11.0% Irish, 10.7% English and 9.6% American ancestry. There were 32,314 households out of which 45.1% had children under the age of 18 living with them, 63.8% were married couples living together, 9.0% had a female householder with no husband present, and 23.8% were non-families. 18.4% of all households were made up of individuals and 3.7% had someone living alone who was 65 years of age or older. The average household size was 2.83 and the average family size was 3.24. In the city, the population was spread out with 30.8% under the age of 18, 9.2% from 18 to 24, 36.7% from 25 to 44, 18.1% from 45 to 64, and 5.2% who were 65 years of age or older. The median age was 31 years. For every 100 females, there were 99.4 males. For every 100 females age 18 and over, there were 96.1 males. The Federal Aviation Administration, a sub-agency of the United States Department of Transportation, administers and maintains an Air Route Traffic Control Center in Olathe, designated Kansas City Center or ZKC. Kansas City Center is one of 20 regional Air Route Traffic Control Centers that cover United States airspace. Johnson County maintains an airport in Olathe, Johnson County Executive Airport, which is located on about 500 acres (2.0 km2) of land with a 4,100-ft (1250-m) runway, parallel taxiways, and a Federal contract air traffic control tower. The airport is the second-busiest in the state. The city of Olathe is served by the De Soto School District, the Olathe School District, the Spring Hill school district and the Blue Valley School District. As of 2008, there are 26,894 students enrolled in the Olathe School District. The Olathe School District has 35 elementary schools, 9 middle schools, and 5 high schools: Olathe North, Olathe South, Olathe East, Olathe Northwest, and Olathe West. Johnson County Transit operates a bus system throughout the county, including Olathe. Willie Aames (born Albert William Upton) is an American actor, film and television director, television producer, and screenwriter. Aames is well known for playing Tommy Bradford on the 1970s television series Eight Is Enough, Buddy Lembeck on the 1980s series Charles in Charge and Bibleman. John Anderson, Jr. was the 36th Governor of Kansas from 1961 until 1965. He was born near Olathe. Earl Browder, a prominent leader in the American Communist movement. He served as Chairman of the National Committee of the Communist Party USA from 1934-1945. He was also the Communist Party USA's candidate for President in the 1936 presidential election and 1940 presidential election. Jonathan Quinn is the current head football coach for the MidAmerica Nazarene Pioneers football team. Quinn also played for the Kansas City Chiefs, Chicago Bears, and for the Berlin Thunder of NFL Europe. Darren Sproles is an American football running back of the NFL who plays for the Philadelphia Eagles. He was drafted by the San Diego Chargers in the fourth round of the 2005 NFL Draft. He played college football at Kansas State University, and high school football at Olathe North High School. Buddy Rogers was an American actor who played the leading role in Wings (1927) which won the first Academy Award for Best Picture in 1929. He was also a notable jazz musician and film producer. The actor was married to film legend Mary Pickford and won an Honorary Oscar in 1986. 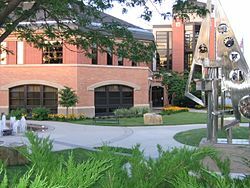 ^ "Olathe was incorporated in 1857 under a charter from the 'Bogus Legislature.' ... Some doubts existed as to the legality of the incorporation and it was re-incorporated in 1868 as a city of the third class...." —Blackmar, Frank W., ed. "Olathe". Kansas: a cyclopedia of state history, embracing events, institutions, industries, counties, cities, towns, prominent persons, etc. ... Vol. II. Standard Pub. Co. (Chicago: 1912) pp. 386–387. ^ "U.S. Census Bureau QuickFacts: Olathe city, Kansas". Census Bureau QuickFacts. Retrieved 2018-06-28. ^ a b "Evolution of Olathe". City of Olathe. Archived from the original on September 28, 2007. ^ Blackmar, Frank Wilson (1912). Kansas: A Cyclopedia of State History, Volume 2. Standard Publishing Company. p. 386. ^ William E. Connelley, Quantrill and the Border Wars (Cedar Rapids, Iowa: Torch Press, 1909), pp. 234, 271. This book may also be found on the Internet Archive website, at https://archive.org/stream/quantrillborderw00connuoft/quantrillborderw00connuoft_djvu.txt . ^ Capt. James Christian, report, The War of the Rebellion (Washington: Government Printing Office, 1899), Series II, Vol. IV, p. 721. ^ John W. Noble, letter, The War of the Rebellion, Series II, Vol. IV, pp. 721-2. ^ First Lieut. Cyrus Leland, report, The War of the Rebellion (1883), Series I, Vol. XXII, Part I, pp. 591-2. ^ Brig. Gen. W. H. M. Fishback, report, The War of the Rebellion (1893), Series I, Vol. XLI, Part I, p. 619. ^ Maj. Gen. John Pope, report, The War of the Rebellion (1896), Series I, Vol. XLVIII, Part I, p. 351. ^ Roberts, Sam (June 28, 2007). "Biggest Urban Growth Is in South and West". The New York Times. Retrieved May 20, 2010. ^ "Best places to live 2008". CNN. Retrieved May 20, 2010. ^ Horsley, Lynn (29 January 2018). "Loss of Olathe's Hubbard House mourned. But preservationists persevere". Kansas City Star. Retrieved 27 March 2018. ^ "Black Bob Park". Olathe Parks and Recreation, Olathe Kansas. Archived from the original on 2008-03-19. Retrieved 2013-02-17. ^ United States Census Bureau. "Census of Population and Housing". Retrieved November 28, 2014. ^ "Johnson County Airports Among Busiest in Kansas". The Olathe News via AirportBusiness.com. 12 January 2011. Retrieved 6 July 2011. ^ "2015 City of Olathe, Kansas Comprehensive Annual Financial Report For the Year Ended December 31, 2015" (PDF). Retrieved February 27, 2017. ^ "District History - Enrollment Growth". Olathe School District. Retrieved 15 September 2010. ^ "Take a look inside the new Olathe West High School". The Kansas City Star. Retrieved 1 September 2017. ^ "Waycross Journal-Herald - Google News Archive Search". Retrieved 17 June 2016. ^ Kestenbaum, Lawrence. "The Political Graveyard: Index to Politicians: Anderson, J." Retrieved 17 June 2016. Wikimedia Commons has media related to Olathe, Kansas. Wikisource has the text of the 1905 New International Encyclopedia article Olathe.